یکی از مطالعات بنیادین مورد نیاز در میادین هیدروکربوری، بررسی گسل‌ها و شکستگی‌های میدان و تعیین نقش آنها در مخزن است. اگر مخزن میدان هیدروکربوری از نوع کربناته و شکاف‌دار باشد، بررسی این ویژگی‌ها درجه اهمیت بالاتری دارند. از آنجا که ساختارهای زمین‎ساختی، جدا از همدیگر نیستند؛ ضروری است این ساختارها به‌طور هم‌زمان مورد مطالعه قرار گیرند که در صورت وجود ارتباط زایشی میان آنها، این ارتباط مشخص شود. در این پژوهش با استفاده از داده‌های چاه‌نگاری تصویری، مقاطع لرزه‌ای و نقشه زمان- ژرفا و در پایان مدل‌سازی تجربی به بررسی احتمالات شکل‌گیری گسل‌های داخلی و شکستگی‌ها پرداخته شده است. جایی که در جلوی جبهه دگرریختی زاگرس بوده است و ظاهراً تنش‌های ایجاد کننده کمربند چین‎خورده- رانده زاگرس در آن تأثیر چندانی نداشته‎اند. 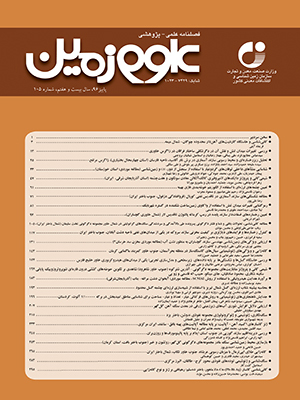 در این میدان نفتی دو دسته گسل با روند و نقش‌های متفاوت شناسایی شده است. دسته اول با روند شمالی- جنوبی با سازوکار وارون به عنوان کنترل‌کننده هندسه ساختار میدان و دسته دوم با روند شمال باختر- جنوب خاور با سازکار عادی که احتمالاً عامل به وجود آورنده شکستگی‌های اصلی در میدان مورد مطالعه هستند. این میدان تحت تأثیر وارون‌شدگی ساختار و تبدیل به یک ساختار فراجسته ایجاد شده است. بر پایه تحلیل‌های انجام شده، گسل‌های درون ساختاری احتمالاً به دلیل بالا آمدن دیواره نمکی و یا حرکت چپ‌گرد گسل‌های مرزی این میدان ایجاد شده‌اند. با تفسیر شکستگی‌های ناشی از حفاری و برون‌شکست‌ها، سوی تنش افقی بیشینه و سوی تنش افقی کمینه مشخص شد. همچنین امتداد دسته دوم گسل‌ها نیز هم‌روند با شکستگی‌های ناشی از حفاری شناسایی شده‌اند. بنابراین روند این ساختارها شامل میانگین شکستگی‌های طبیعی، برون‌شکست‌ها و روند گسل‌های عادی محلی با یکدیگر همخوانی دارند که می‌تواند منشأ شکستگی‌ها را زمین‌ساختی معرفی کند. One of the essential studies in exploration, exploitation and development of hydrocarbon fields is to evaluate the fault and fracture systems and the role that they can play in reservoir quality and geometry. If the hydrocarbon reservoir is a fractured carbonate reservoir, assessing the mentioned properties is of great importance. Assessment of the structures should be done simultaneously because of their close relations, and the their probable genesis connection should be revealed. In this research, subsurface data including 2D seismic profiles, underground contour maps and FMI log and eventually analogue modeling have been used for evaluation of probable scenarios explaining formation of faults and fractures. The studied area is located at the front of Zagros deformation belt and the Zagros stresses have apparently not affected it. Two sets of faults of different geometry and role have been detected; the first reverse set (N-S trending) was apparently controller of the reservoir geometry in the structure; the second normal set (NW-SE trending) are most likely causative of the main fractures in the field. It is likely that positive inversion tectonic of the basin led to the development of this field in form of a pop-up structure. Based on the interpretations, the internal normal faults have been formed probably by the rise of Hormuz salt or by local stretching due to left-lateral component of the boundary reverse faults. Using interpretation of drilling-induced fractures and break-outs derived from FMI, trends of the Shmax and Shmin are determined. Also it was revealed that the natural fractures and the main set 2 of faults are sub-parallel with the fractures induced by drilling. Therefore, the compatibility between trends of the natural fractures, breakouts and local normal faults can suggest a tectonic origin for the natural fractures. Ahr, W. M., 2008- Geology of carbonate reservoirs, the identification, description, and characterization of hydrocarbon reservoirs in carbonate rocks, John Wiley and Sons, USA. Barton, C. A. and Zoback, M. D., 2002- Wellbore imaging technologies applied to reservoir geomechanics and environmental engineering, in M. Lovell and N. Parkinson, eds., Geological applications of well logs: AAPG Methods in Exploration, No. 13, p. 229–239. Bell, J. S., Price, P. R. and McLellan, P. J., 1990- In-Situ Stress in the Western Canada Sedimentary Basin [Abstract]. Bulletin of Canadian Petroleum Geology, 38(1), pp.157-157. Cheung, P., Hayman, A., Laronga, R., Cook, G., Flournoy, G., Goetz, P., Marshal, M., Hansen, S., Lamb, M., Larsen, M., Li, B. and Orgen, M., 2002- A Clear Picture in Oil Base Muds.Oil field Review, 2001/2002. Cooper, M. A., Williams, G. D., De Graciansky, P. C., Murphy, R. W., Needham, T., De Paor, D., Stoneley, R., Todd, S. P., Turner, J. P. and Ziegler, P. A., 1989- Inversion tectonics—a discussion. Geological Society, London, Special Publications, 44(1), pp.335-347. Cosgrove, J. W. and Ameen, M. S., 2000- A comparison of the geometry, spatial organization and fracture pattern associated with forced folds and buckle folds. Geological Society Special Publication No. 169. Harris, J. F., Taylor, G. L. and Walper, J. H., 1960- Relation of deformation fractures in sedimentary rock to regional and local structure. Am. Assoc. Petroleum Geologists. Bull., V. 44, No. 12, p. 1853-1873. Khoshbakht, F., Azizzadeh, M., Memarian, H., Nourozi, G. H. and Moallemi S. A., 2012- Comparison of electrical image log with core in a fractured carbonate reservoir. Journal of Petroleum Science and Engineering, V. 86–87, p. 289-296. Nelson, R. A., 2001- Geologic analysis of naturally fractured reservoirs. Gulf professional publishing is an imprint of Butterworth–Heinemann. 2nd ed. P. 350. Nie, X., Zou, Ch., Pan, L., Huang, Zh. and Liu, D., 2013- Fracture analysis and determination of in-situ stress direction from resistivity and acoustic image logs and core data in the Wenchuan Earthquake Fault Scientific Drilling Borehole 2 (50–1370m), Tectonophysics 593: 161-171. Price, N. J. and Cosgrove, J. W., 1990- Analysis of geological structures, Cambridge University Press, Published in Great Britain at the University Press.p.509. Rajabi, M., Sherkati, S., Bohloli, B. and Tingay, M., 2010- Subsurface fracture analysis and determination of in-situ stress direction using FMI logs: An example from the Santonian carbonates (Ilam Formation) in the Abadan Plain, Iran. Tectonophysics, V. 492, Issues 1–4, 20, p. 192-200. Stewart, S., 2006- ImplicaXons of passive salt diapir kinemaXcs for reservoir segmentaXon by radial and concentric faults. Marine and Petroleum Geology 23(8): 843- 853. Talebian, M. and Jackson, J., 2004- A reappraisal of earthquake focal mechanisms and active shortening in the Zagros mountains of Iran. Geophysical Journal International 156(3): 506-526. Tingay, M. and Heidbach, O., 2005- Understanding tectonic stress in the oil patch: The world stress map project. The Leading EDGE. Tingay, M. R. P., Müller, B., Reinecker, J. and Heidbach, O., 2006- State and origin of the Present-Day Stress Field in sedimentary basins: New results from the world stress map project. The 41st U.S. Symposium on rock mechanics (USRMS). 06-1049. Tokhmchi, B., Memarian, H. and Rezaee, M. R., 2010- Estimation of the fracture density in fractured zones using petrophysical logs. Journal of Petroleum Science and Engineering, V. 72, p. 206-213. Turner, J. P. and Williams, G. A., 2004- Sedimentary basin inversion and intra-plate shortening, Earth-Science Reviews 65(3): 277‐304. Van Golf-Racht, T. D., 1982- Fundamentals of fractured reservoir engineering. Elsevier Scientic publishing company, V. 12, p. 729. Vernant, P., Nilforoushan, F., Hatzfeld, D., Abbassi, M. R., Vigny, C., Masson, F., Nankali, H., Martinod, J., Ashtiani, A., Bayer, R., Tavakoli, F. and Ch ́ery, J., 2004- Present-day crustal deformation and plate kinematics in the Middle East constrained by GPS measurements in Iran and northern Oman, Geophysical Journal International 157(1): 381-398. Willis, B., 1893- The Mechanics of Appalachian Structure: US Geological Survey. 13th Annual Report, Part 2, 211–281. Zarifi, Z., Nilfouroushan, F. and Raeesi, M., 2014- Crustal stress map of Iran: insight from seismic and geodetic computations, Pure and Applied Geophysics 171(7): 1219-1236. Zazoun, R. S., 2013- Fracture density estimation from core and conventional well logs data using artificial neural networks: The Cambro-Ordovician reservoir of Mesdar oil field, Algeria. Journal of African Earth Sciences, V. 83, p. 55-73. Zoback, M. D., 2007- Reservoir geomechanics, Cambridge University Press, Published in the United States of America by Cambridge University Press, New York. p. 464.